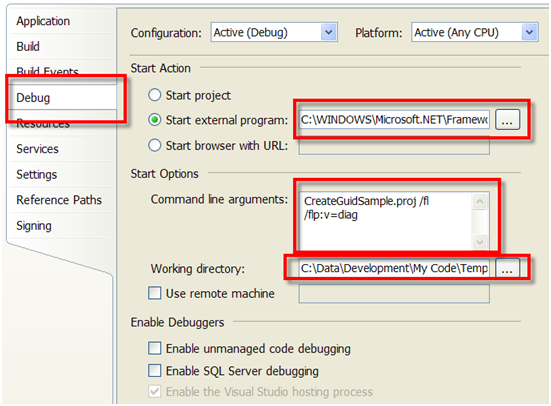 A question that comes up pretty frequently is "How can I debug an MSBuild task"? It's actually pretty simple. In this post I will describe how to easily an effectively debug MSBuild tasks that you are creating. In this example I will be demonstrating a task from my open source tasks at www.codeplex.com/Sedodream. The task is one that was contributed by Grant Holliday. First in the project where your tasks are contained create a folder that will be used to contain sample MSBuid files that can be used to debug the tasks. This is also a good idea, because it will show people how to use your tasks. If you are don't want to mix samples & code in the same project then just make sure in your build you copy the files to the correct locations. In the sample project, which you can download at the bottom, the folder is named Samples. 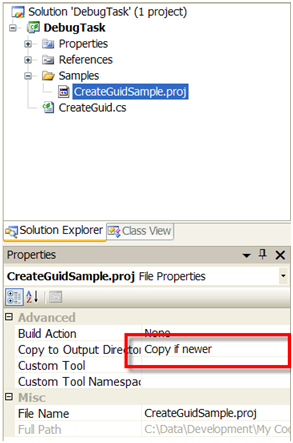 When you add MSBuild files to the folder make sure you set the file to be copied to the output folder as well. See the image below. By setting this, the file will be copied to the output folder when the project is built. Since it will be in the output folder we can use a relative path to get to the assembly that contains the task. Take a look at the sample MSBuild file for this task. The line highlighted contains the path to the assembly that contains the task. This path is relative to the location in the output folder, not the source folder. Also another thing to take note, is that we only write to the TaskLocation property if it is empty. This is useful because you can overwrite the location through command line parameters if necessary. But this shouldn't be needed for what we are trying to accomplish here. After you create the sample, build the solution. And open a command prompt to verify that it works. Here is a sample of the result of this project file. Once you've verified that that MSBuild file works then you can right click on the project that contains your task, and select properties. From there go to the debug tab. What we want to do is start the msbuild.exe executable on that sample project file. To do this fill in the full path to it in the Start External program text box, i.e. 'C:\WINDOWS\Microsoft.NET\Framework\v3.5\MSBuild.exe'. In the command line arguments you should pass the name of the project file followed by any msbuild parameters. Typically I will attach a file logger to the process. Finally you should set the working directory to the folder containing the sample. The result should look something like the image shown below. Following this set a break point in your task, set the project as the startup project and hit F5! Another thing to take note of is that these properties are stored in the .user file so it shouldn't affect any other developers on your team. Below is the link containing a simple solution that was used here.